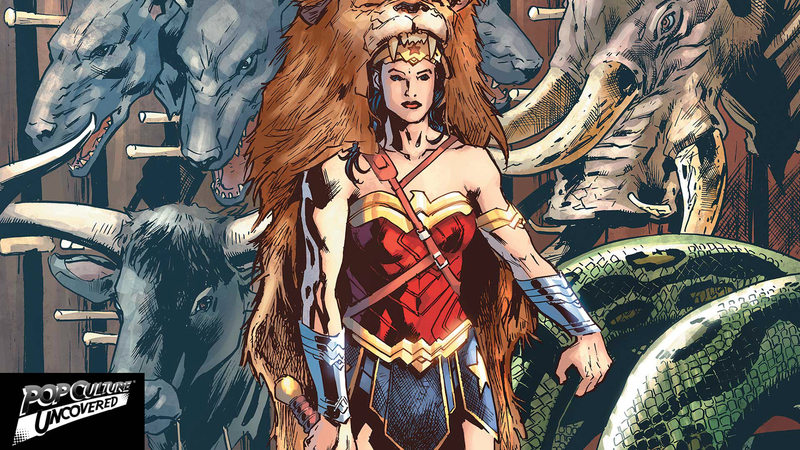 After the revelation in the previous issue, Diana, Steve and the boys head out to deal with her inheritance, which leads to more questions than it does answers for our heroine. This issue, for all of its beginning action, is a more quiet and contemplative one as Diana explores what it means to be a child of Zeus and the gifts, and burdens, that comes with. It also looks at how time changes one’s perspective on everything: the world, your actions and the past, and how, when you’re tacitly immortal (barring attacks by Darkseid or his brats) you have more time than you might ever want to really think…. I wasn’t sure how I initially felt about the artwork by Sergio Davila, Scott Hanna, and Mark Morales, but I have to say upon re-reading the issue it grew on me. Beyond the fact that I loved the little details on the Oddfellows (Charlie’s kilt made me laugh in delight), they do a fantastic job on the action scenes as well as the smaller character work. Blake Hopper in particular stands out and I can tell someone loves Hercule Poirot via David Suchet almost as much as I do. James Robinson is doing some interesting world building, blending in what’s come before (specifically Kirby’s New Gods and Fourth World storylines) while at the same time layering in a sense of impending doom. Something is coming for Diana and her family. It’s not what we think, and more than likely it’s going to be devastating. Five Lion Pelts out of Five.